14 countries of EECA and Balkan regions will be able to save more than $ 73.4 million thanks to optimized procurement of antiretroviral drugs and optimization of treatment regimens. These funds will allow reallocation of funding and expansion of treatment programs and services for key populations in countries. 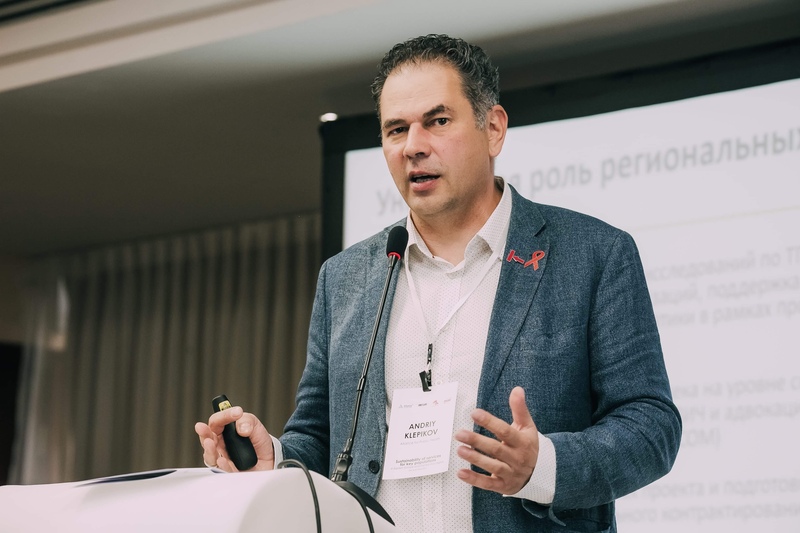 This was announced by Andriy Klepikov, Executive Director of the Alliance for Public Health during the presentation of the regional project “Sustainability of Services for Key Groups in the EECA Region”, which was shortly named #SoS_project. “The enormous savings at the regional level are very well and in details calculated,” – emphasized Andriy Klepikov. – “This is not a figure from the ceiling. Behind it, there are strategic calculations, analytics, which is confirmed at the level of each country as well as on regional level. There are some specific calculations that have already been transformed into a commitment format in some countries, because in all countries these applications were approved by the CCM – the national coordination mechanisms for HIV/AIDS”. The regional project “Sustainability of Services for Key Groups in the EECA Region” is the largest and most comprehensive regional project of the Global Fund to Fight AIDS, Tuberculosis and Malaria in Eastern Europe and Central Asia. It brings together 14 countries of the EECA region and southeastern Europe and the 23 cities with the highest burden of prevalence of HIV/AIDS. “Unfortunately, we cannot work at the same time everywhere,” – says the executive director of the Alliance for Public Health. – “Therefore, we have chosen 23 cities with the largest number of HIV-cases. This is a reasoned choice when, effectively working in cities, you can influence the effective response of the HIV/AIDS epidemic and at the state level”. The main goals of the project are to increase the financial sustainability and effectiveness of HIV programs, remove the most significant barriers to accessing prevention and care services for PLHIV, and increase the effectiveness and accessibility of HIV services delivery models for key populations. To achieve these goals, the Global Fund provided financial support in the amount of $ 13 million. Andriy Klepikov said that almost half of these funds ($ 5.6 million) will go to the advocacy of the reduction of prices for ARV drugs and optimization of procurement mechanisms. Another quarter of the project budget ($ 3.2 million) is planned for budget advocacy. $ 1.6 million is provided for the removal of legal barriers, the same amount for project management. Another $ 1 million will go to operational research. The #SoS_project team will actively cooperate with all those who can provide, and/or affect the necessary changes, both from civil society and government agencies. It is also planned to interact with recipients of country GF grants to achieve common goals and successful experience in introducing innovations in some countries of the region will be extended to other states. All actions to introduce innovations will be accompanied by operational research, which will become the evidence-based research for launching new initiatives. “The idea is not only to throw in some initiatives, but simultaneously with such interventions to launch operational research, which will help identify and prove their effectiveness,” explained Andriy Klepikov. – “It worked, in particular, in Ukraine. But we would not want other countries to take it on faith. In each country for advocacy, before the Ministry of Health will start funding, it is important to get a serious evidence base, which is collected through operational research”. According to the plans, budget advocacy within the project will consist of the following elements: development/updating of the functional mechanisms of public procurement of prevention and care services and support services from NGOs; increasing the capacity of NGOs and government representatives on budget advocacy, reallocation of financial resources, relations with government structures; support for the development of national social contracting guidelines; advocacy for the adoption of municipal programs and funding related activities. Moreover, as part of the project, it is planned to attract $ 10.250 million in prevention programs for key groups from savings made through the project. The implementation of the three-year The Global Fund project will be coordinated by the Alliance for Public Health, in a consortium with the 100% Life (All-Ukrainian Network of PLWH), the Central Asian HIV’ Association and the Eurasian Key Populations Health Network, with the participation of national governmental and non-governmental organizations, regional key populations networks , international agencies and organizations, as well as technical partners.